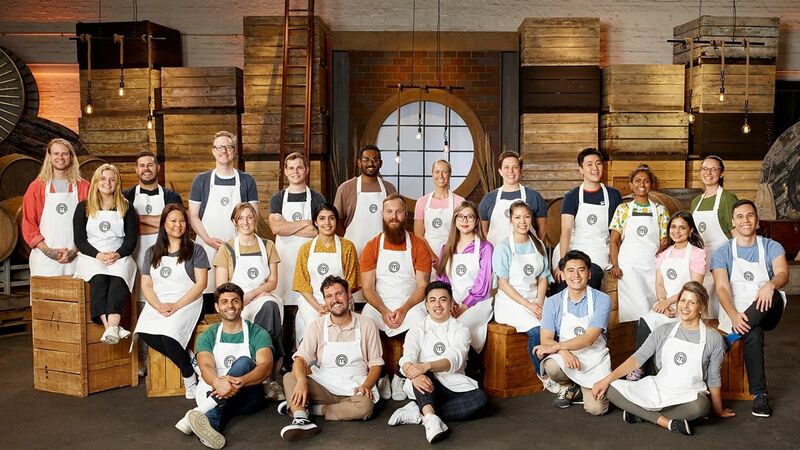 Here's where to watch every episode of MasterChef Australia season 1. Mouseover or tap an episode to see where to stream it. Click or tap the play icon to stream it on the best available service. Sydney Sizzles Apr 27, 2009 The auditions begin! Audition 2 Apr 28, 2009 Brisbane and Perth Deliver. Top 50 (1) - Taste Test Apr 30, 2009 In the first ever Masterchef Australia elimination challenge, 12 contestants fighting for their place in the competition choose from a large variety of fresh ingredients and have just 45 minutes to be as creative as possible to impress the judges. Cooking With The Masters May 8, 2009 Masterclass 1 - Cooking with the masters - Lamb Rack with Pomme Puree, Pain Perdu with Chocolate Mousse. The Tarte Tatin Test May 11, 2009 Pressure Test Elimination - Julie, Aaron and Linda landed in the Bottom 3 for their disasters in the invention test. Banquet Wars May 13, 2009 The teams each prepare a feast for guest judge, Curtis Stone. Class Is In May 15, 2009 Masterclass 2 - Class is in - Poached Egg Salad with Tomato Tea (consume), Roast Saddle of Rabbit with White Bean Puree. Attack of the Killer Squid May 18, 2009 Pressure Test Elimination - Michelle, Sam and Kate had to cook squid in their challenge. Julia and the Duck May 19, 2009 The MasterChef contestant takes on the celebrity chef at his own game. Aisle Panic May 20, 2009 A three course meal for three food critics has the contestants in a tizz. An Emotional Elimination May 21, 2009 The blue team’s decision leaves more than one contestant upset. The Steaks are Raised May 24, 2009 The contestants impress the judges with their challenge efforts. Feeding Frenzy May 27, 2009 The teams race to feed the hungry hordes. Kate's Tough Decision May 28, 2009 The team captain has the final say as to who should go. Best of British May 31, 2009 John Torode from the UK MasterChef rates the contestants. Paella Pain Jun 1, 2009 Pressure Test Elimination - Aaron, Sandra and Julie faced elimination and had to make paella. The Great Bait Debate Jun 4, 2009 The blue team decides whether to send their captain home. Lemon Goodness Jun 5, 2009 Masterclass 5 - Lemon Goodness - Lobster Bisque, Tuscan Vegetable Soup, Roast Chicken with Buttery Potatoes, Lemon Diva cupcakes. Not So Sweet Jun 8, 2009 Pressure Test Elimination - Tom, Poh, Chris and Julie had to make Croquembouche. And Then There Were Seven Jun 11, 2009 The blue team say goodbye to another contestant. Terrine Trauma Jun 15, 2009 Pressure Test Elimination - Geni, Poh and Andre were in the bottom three and had to make salmon terrine. Here Comes the Bride Jun 17, 2009 The contestants cater a wedding on water. Grain Pain Jun 18, 2009 Taste Test Elimination - Poh and Sam named ingredients in a pot of minestrone. Battle of the Sexes Jun 24, 2009 Hong Kong - Mystery Steamer Challenge and Super Challengee. Vision Quest Jun 29, 2009 The contestants cook their dream menu for the judges. Christmas in July Jul 5, 2009 The contestants deliver some festive cheer. Macaroon Madness Jul 6, 2009 Pressure Test Elimination - Sam, Poh, Chris and Andre had to cook a combination of panna cotta, passionfruit emulsion ("passionfruit slick") and filled macaroon biscuits. Pie Wars Jul 13, 2009 Elimination Challenge 1 - The contestants had to make two pies - one sweet and one savoury, making their own pastry. Poh's Advantage Jul 14, 2009 Elimination Challenge 2 - As Poh had won the pie challenge she designated Malaysian as the theme and picked coconut cream and ling fish for the core ingredients. The contestants had 90 minutes to make two courses. No Piece of Cake Jul 15, 2009 Elimination Challenge 3 - The third elimination challenge emulated the pressure test challenge where the contestants had to make a several layered 'Chocolate Mousse' cake. The Tables Are Turned Jul 17, 2009 Masterclass Reunion - The Top 20 contestants were reunited in the final Masterclass and revealed what they have been up to since leaving the show. Poh and Julie also challenged George and Gary to a Mystery Box Challenge. The Grand Finale Jul 19, 2009 Finale Night - Poh and Julie competed against each other in three rounds consisting of a Taste Test, an Invention Test and a Pressure Test. Points would be earned for each test, with the winner decided based on the final tally after the three tests.